While the spot price has trended higher for the last year, Cameco warns that could be reversed if new projects come online or other projects are ramped up. Despite the spot price of uranium steadily increasing in 2018, Canada’s largest uranium producer Cameco (TSX:CCO,NYSE:CCJ) is still cautiously optimistic about the future of new projects. Depressed uranium prices in 2017 and the early part of 2018 forced Cameco to place the McArthur River mine — the country’s largest uranium mine — on care and maintenance indefinitely, removing a significant supply from the market, which helped the spot price rally in the latter half of the year. “Spot prices have increased by more than 20 percent since the beginning of 2018, and some interest in long-term contracting is emerging,” noted the company’s recently released discussion and analysis report. The extended closure of McArthur, which was announced in late-July 2018, removed 18 million pounds of uranium from the market. 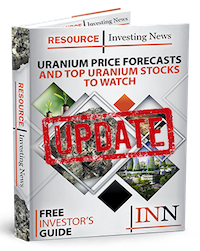 Prior to the announcement, the spot price of uranium sat at US$22.65, five days after Cameco revealed its plans to extend the McArthur closure the spot price climbed to US$25.78. Today (February 11), the U3O8 spot price sits at US$28.90. “We saw a significant improvement in the spot market driven by substantial production cuts, cuts to some secondary supplies, a reduction in producer inventories, and an increase in demand for uranium in the spot market from producers and financial players,” Tim Gitzel, Cameco’s president and CEO noted in the Q4 press release. Concern over spot price movement wasn’t the only issue Cameco was confronted with in 2018. After battling with the Canada Revenue Agency over the 2003, 2005 and 2006 tax years, the Tax Court of Canada ruled in Cameco’s favor. The win not only vindicated the uranium company, it raised Cameco’s shares 15 percent. While the spot price has trended higher for the last year, Cameco warns that could be reversed if a bunch of new projects come online or other projects are ramped up. A widespread restart could have negative implications to a delicate market that is still in the midst of a recovery. Concern over the US implementing domestic uranium production quotas, or levying heavy tariffs on foreign uranium is also weighing on the sector and could potential create supply problems down the road. Cameco shares were up 2.40 percent on Monday (February 11), trading at C$16.88.